Dress up your party with Halloween ribbons and designs and have a spooky holiday! Use any personalized Halloween ribbons to make your holiday more fun. From ribbon rolls to rosettes, we are sure to have what you need to spice up your party and make things enjoyable for everyone in attendance. And, with personalization and a spooky message, your party will be the best one in the neighborhood or building. Ribbon rolls are sure to be a big hit on any custom treat you give to trick-or-treaters. Wrap up baked goods in a baggie and add some colorful and festive ribbons to secure any coveted treat. Kids are sure to tell their friends that your house is the best one on the block. 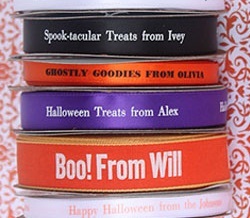 Before you know it, with the use of these personalized Halloween ribbons, you’ll be treat-free! From hanging signs around your home to adding a final touch on a table decoration, ribbon rolls are one-of-a-kind! And, when it comes to the spookiness of the holiday, Halloween ribbons can add a little fun too. Go with traditional colors of white, black and orange. Or be a bit more colorful with purple, red and green. But, whatever ribbon you go with, make sure to personalize it with your special holiday message. 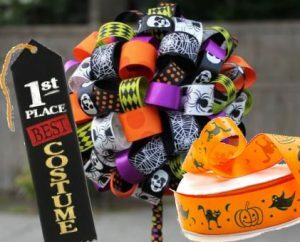 Give Halloween ribbons for personalized awards for the best costume you see. Add themed graphics or icons to each ribbon such as a spider or pumpkin to make them more fun. Make sure your party attendees know just how original their costume is with this one-of-a-kind prize. 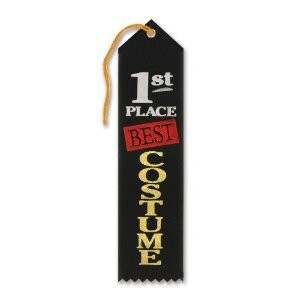 Everyone at your party is sure to covet one of your award ribbons. Blank badge ribbons are perfect for holiday party games. And, they even work for unique decorations. Use them as table scatter for your party or a company potluck. Or, give your name badge at work a spooky turn with a fun and festive title. Again, add logos and graphics to show off your fun side. Use titles such as: Have A Spook-Tacular Day, Happy Halloween or BOO! But no matter what, make sure to have fun with it. Choose a ribbon in your favorite Halloween color or a color that matches your costume. Use your imagination and create Halloween ribbons that are sure to wow this holiday!